Figure 1. 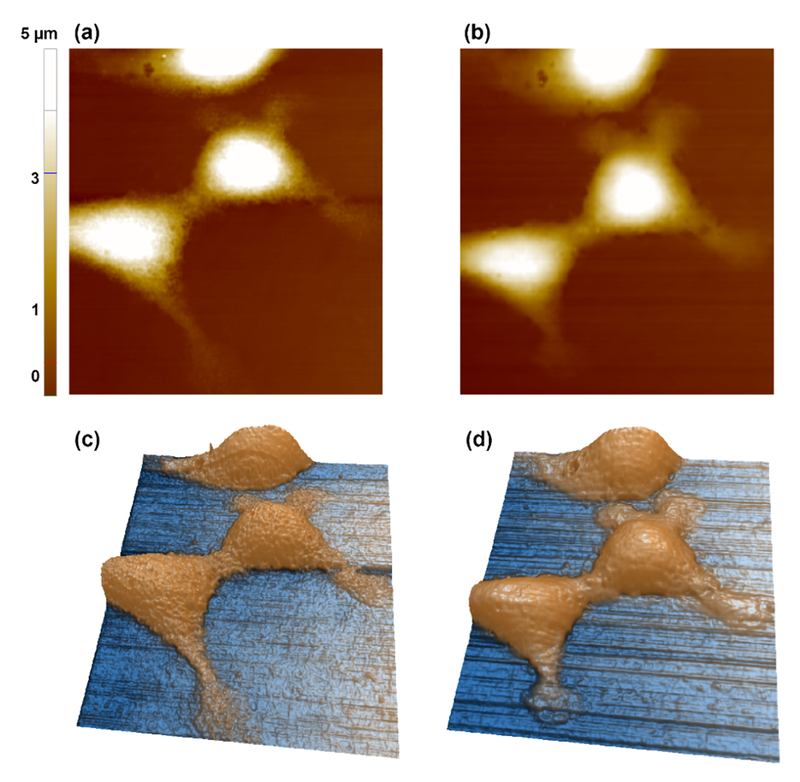 Optical images of L929 cell for AFM (a) and SICM (b). Each probe was positioned at the apex of the single cell. One of the primary objectives of cell fixation for in-vitro studies is preservation of the cell or cellular components in a life-like state by conserving essential chemical and physical characteristics of the cells. Cell fixation is also useful in immunostaining by allowing antibodies to access intracellular structures . Comparing live and fixed cells, the fixed cell maintains a more uniform architecture over the entire cell surface . 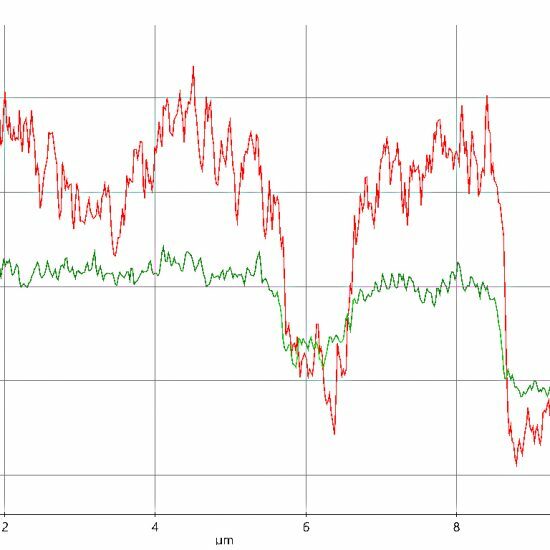 However, there is no systematic assessment or correlation between changes in mechanical properties of live and fixed cells. By observing various states of cell fixation and the living cells, there is an opportunity to optimize cell fixation protocols, and gain valuable knowledge in aiding the process of cell fixation. Many fixation agents are available for cross-linking cell membranes and cytoplasmic proteins, with paraformaldehyde (PFA) as the most widely used for cell and tissue samples [1-3]. PFA works by covalently cross-linking molecules, bonding them together and creating an insoluble meshwork that alters the mechanical properties of the cell surface. In order to investigate the mechanical properties of live and fixed cell structures fixed with PFA, Atomic Force Microscopy (AFM) and Scanning Ion Conductance Microscopy (SICM) were used to measure the elastic modulus and surface fluctuation, respectively [3-6]. Figure 2. 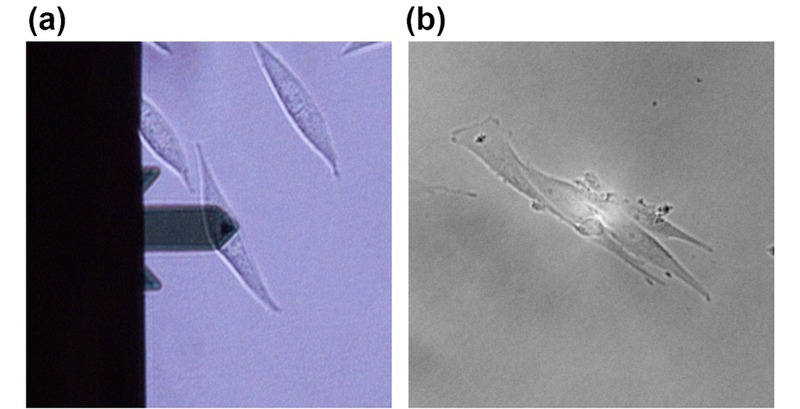 Live (a),(c) and 4% PFA treated (b),(d) cell surface imaging by SICM. The cell sample used consisted of mouse fibroblast L929 cells (ATCC, USA) cultured in Dulbecco’s modified eagle medium (DMEM; Invitrogen Life Technique, USA) complemented with 10% fetal bovine serum (Thermo Fisher Scientific, US) together with 1% penicillin/streptomycin (Invitrogen Life Technique, USA) at 37°C in a humidified atmosphere with a 5% CO2 concentration.Cells (with densities of 1×104 / mL) were placed on a 35 mm diameter cell culture petri dish (NUNC, Denmark),washed three times with phosphate buffered saline (PBS, Sigma-Aldrich, US) and treated with a 4% PFA solution for 5 min. The fixed cell samples were rinsed with PBS three times prior to conducting AFM and SICM experiments. The setup for cell imaging consisted of the Park Systems scanning probe microscope (Park NX-Bio, Park Systems, Korea) equipped with an inverted optical microscope (Nikon Corp., Japan) specifically designed for biological applications. 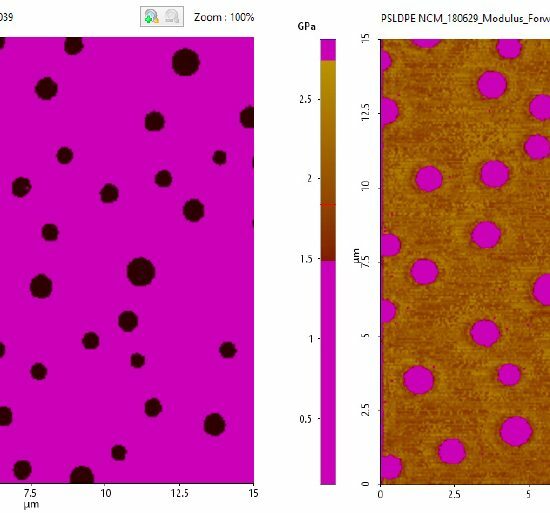 The AFM can gather the mechanical properties of a sample as well as cell surface information of soft material samples using SICM. All experiments performed on live cells were carried out in a live cell chamber. The chamber conditions of the live cell were regulated to 37 °C, 5% CO2 and 95% humidity and had the necessary environment to sustain living cell cultures. Where E is the Young’s modulus, ν is the Poisson’s ratio and δ is the indentation (depth). Poisson’s ratio was set to 0.5 and α was set to 35°. The AFM scan rate was set to 1µm/s and the maximum loading force was 8 nN. SICM utilizes an ion current that flows between an electrode placed inside a nano-pipette and an external electrode located in a bath solution (Figure 1b). The ion current provides a feedback signal that regulates a constant tip-to-sample distance and allows the nano-pipette to scan topographical information. Despite having low lateral resolution (~30 nm) , SICM can display useful topographical measurements without the need to apply mechanical forces onto the sample surface. Figure 2 shows the height images of the live and fixed L929 cell. At first glance, there is no difference between two cases; however, the surface of the fixed cell is slightly rougher due to cross-linking of cell membrane proteins. To perform SICM imaging and ion current-distance (I-D) curve experiments, 80 nm inner diameter nano-pipettes were fabricated from borosilicate capillaries (inner diameter 0.6 mm, outer diameter 1.0 mm, World Precision Instruments, SSA) using a CO2-laser pipette puller (Sutter Instruments, USA). Figure 3. Average force-distance curves (a), and ion-current-distance curves (b) of the solid substrate (black), 4% PFA treated (fixed) cell (red) and live cell (blue). A fundamental mechanical difference has been demonstrated by comparing live cells and cells fixed with PFA. 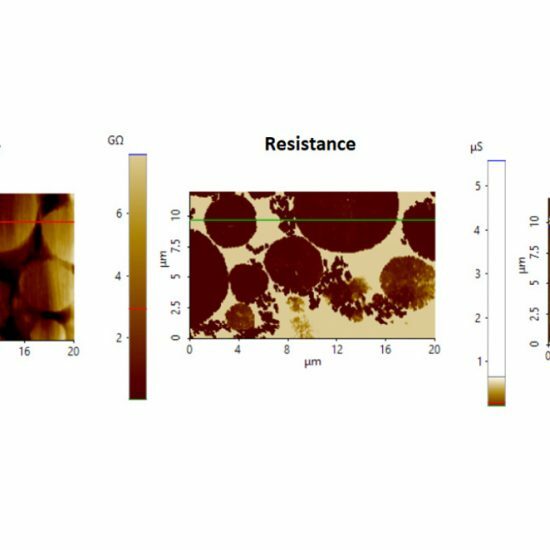 Atomic force microscopy and scanning ion conductance microscopy measurements revealed a definite transition in surface fluctuation and elastic modulus of cells when exposed to PFA. Proceeding complete fixation with PFA, cell surface fluctuation decreased as compared to a live cell while the Young’s modulus increased by five-fold. These findings provide key insights into how cells react to chemical treatment with PFA. In addition to the traditional knowledge of the chemical influence of PFA on cells, this study has uncovered the effect of PFA on the mechanical properties of the cell’s surface. Cell membranes are assumed to be flexible and variable; however, in certain situations (chemical treatment in particular), transformations occur on biological and morphological levels. Such observations provide a strong motive for further study on cell surface fluctuations as a crucial requirement for the understanding of cell functions regarding cell dynamics. Scanning probe microscopy techniques, specifically the AFM and SICM, clearly serve as vital tools in the application of quantitative studies on both fixed and live cells. Lanier, L. and N. Warner, Paraformaldehyde fixation of hematopoietic cells for quantitative flow cytometry (FACS) analysis. Journal of immunological methods, 1981. 47(1): p. 25-30. Yamane, Y., et al., Quantitative analyses of topography and elasticity of living and fixed astrocytes. Journal of electron microscopy, 2000. 49(3): p. 463-471. Binnig, G., C.F. Quate, and C. Gerber, Atomic force microscope. Physical review letters, 1986. 56(9): p. 930. Korchev, Y.E., et al., Scanning ion conductance microscopy of living cells. Biophysical journal, 1997. 73(2): p. 653. Cappella, B. and G. Dietler, Force-distance curves by atomic force microscopy. Surface science reports, 1999. 34(1): p. 1-104. Mizutani, Y., et al., Nanoscale fluctuations on epithelial cell surfaces investigated by scanning ion conductance microscopy. Applied Physics Letters, 2013. 102(17): p. 173703. 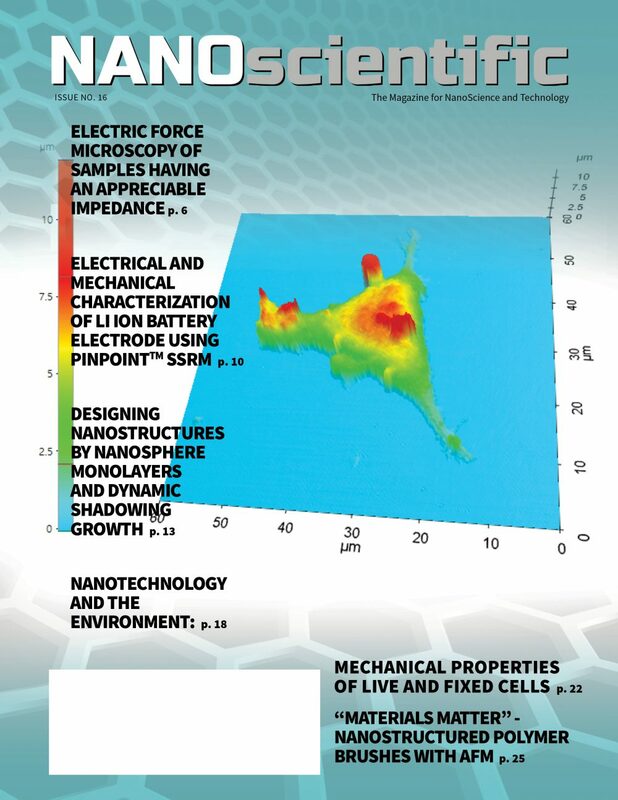 Rheinlaender, J., et al., Comparison of scanning ion conductance microscopy with atomic force microscopy for cell imaging. Langmuir, 2010. 27(2): p. 697-704. Hopwood D. Theoretical and practical aspects of glutaraldehyde fixation. In Fixation in histochemistry, Springer, Boston, MA. 1973: p. 47-83. Tanaka KA, et al., Membrane molecules mobile even after chemical fixation. Nature Methods. 2010 Nov;7(11):865.